The cost of the first night will be charged in case of canceling 2 weeks before the check-in, in case of canceling within 10 days prior to check in there will be no refund. Hotel Festival Plaza is located in the center of Rosarito, one block from the beach and 33.5 kilometers (20.8 mi) from the Tijuana airport. The buzzing Rosarito nightlife is just steps from the hotel. 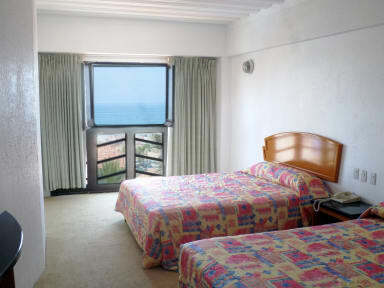 The rooms at the hotel have basic amenities including cable television, bathroom with shower, ceiling fan and telephone. Enjoy during your stay at the Festival Plaza hotel in Rosarito the spa including aromatherapy treatments, massages and facials. The pool at the Festival Plaza hotel invites you to relax and the Jacuzzi is ideal for enjoying a fun time with friends. The restaurant-bar allows you to enjoy a filling meal or refreshing drink, open only on Saturday and Sunday. 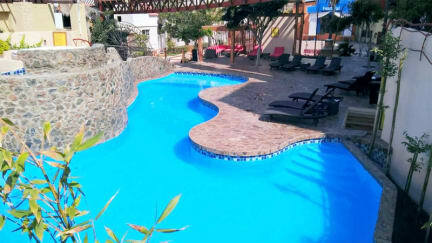 The hotel also has meeting rooms for up to 200 persons. Check in time: 3:00 p.m. - 8:00 pm. - Checo Out: 12:00 p.m.
Everything was excellent, staff were friendly including security. Car Valet was personable and careful with our car. The location is perfect with one exception. If you are not there to stay up late on the weekends and party, you will be up late anyway as the local bars are extremely loud. And they are loud to about 5 am. I knew this going in, and went in forewarned. I would stay here again as we had a great time and loved the accommodations and location. If you want quiet, book during the week. Did not like that you cant even have visitors go upstairs to your room they can only come to the lobby. Better customer service! AC in room please. No one under the age of 25 should stay here. We were on the fourth floor and you could hear the DJ until 5am both nights we stayed. The room was gross the walls were dirty the carpet was gross and dirty. The bed spreads I don’t think have ever been washed. Everything in the room looked worn and just dirty. The wall paper in the bathroom was peeling and lots of patch work badly done. There was a plaque on the bathroom wall like something had been hung there and was ripped off the wall.